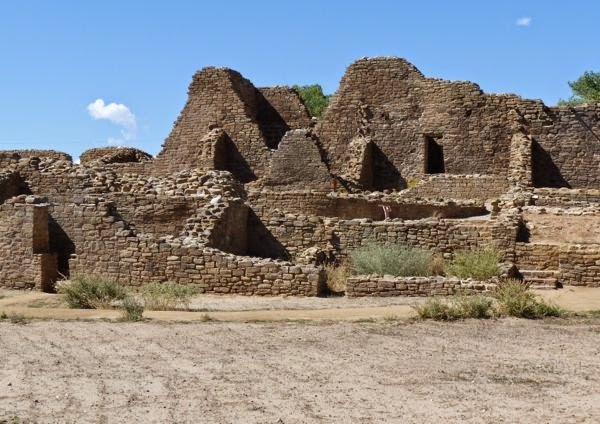 In far northwest New Mexico was the Aztec Ruins National Monument. 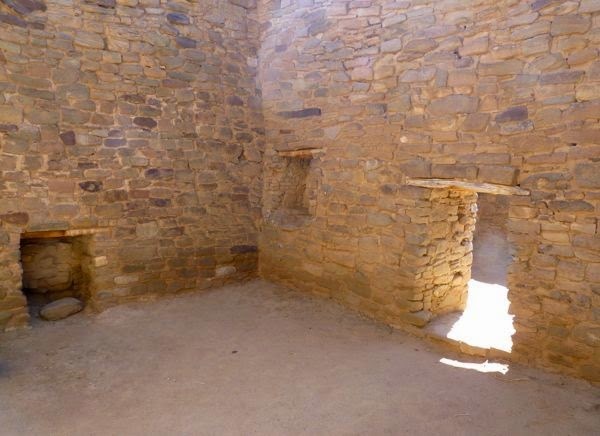 Another preserved pueblo site. 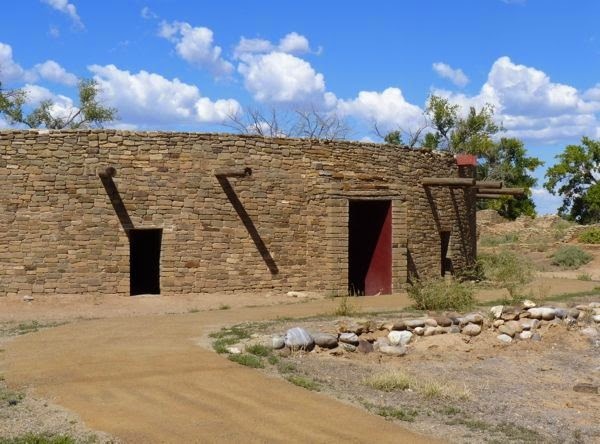 However, this one has the only restored and functioning Great Kiva. Natives continue to use it for ceremonies. Before going, I stopped at Blake’s Lot-a-burger to have a green chile cheeseburger and fries for lunch. When in New Mexico, it is required dining. There were better options; but, it was close to the park entrance. They believe these natives came from the Chaco Canyon settlement. The building techniques and style were the same. 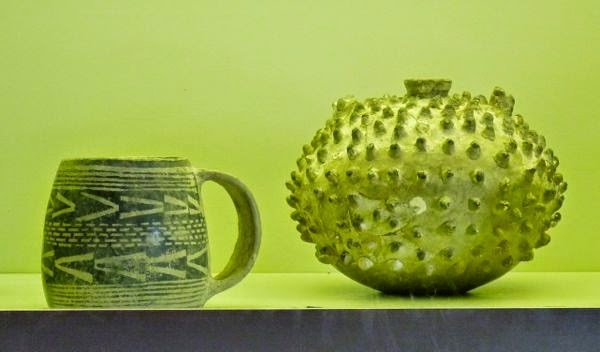 As well as the pottery and implements found during it’s early occupation. Only a small portion of the ruins have been excavated. 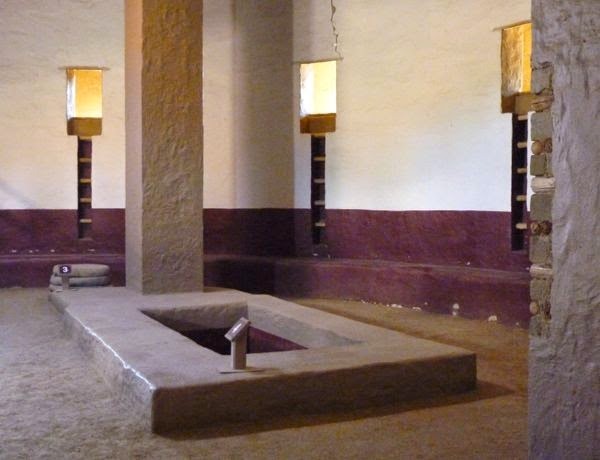 The 500 room, 3 story pueblo was built oriented to the solstice and so provided info for the seasons and planting times. 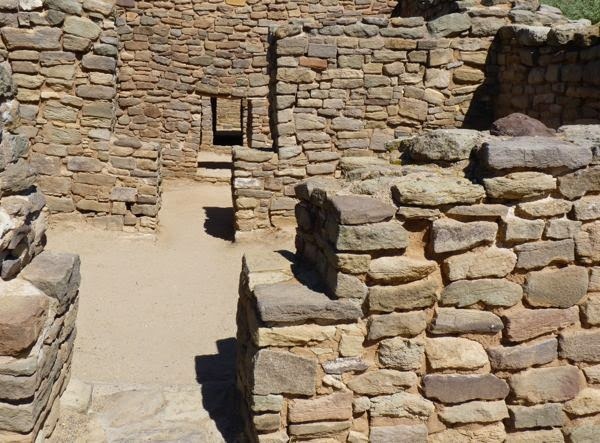 The pueblo was later abandoned, but reoccupied by another group of natives from the Mesa Verde area. Tools and pottery from there were found in later trash piles. The pueblo was located near the Animas River; so, fish, birds, rabbit, deer and other game would have been available. And, they now have a garden planted with crops from heirloom seeds found on site. A nice variety of corn, squash, beans, amaranth, and a few others are grown. Afterward, I drove east on a state highway that went up and down hills, and not the best surface, to my next camp. I turned onto a gravel county road, and went two miles on the washboard, and found the Cottonwood Campground was full. Aargh! So, back out onto that awful road, and drove back to the paved highway and on up to Navajo Lake State Park; where I got an electric and water site amongst the pines. It had a view of the lake through the trees, and to a mesa beyond. Ick, two miles of washboard for nothing! I feel your pain. Navajo Lake is one of the very few NM state parks I have never visited. Maybe one of these days it’ll happen. I was not impressed with Pine CG. However, I’ve heard that Sims Mesa CG, on the other side of the lake, has a good view. It is accessed via a different road. That was quite a city for its time. Or for any time. Agreed. And, they were fairly advanced for their times too. Yes, we falsely believe that ancient people were not as intelligent as modern man. They just didn’t have as much history behind them to for guidance. Most everything they did was done for the first time.